The first trend is a black & white striped chiffon blouse and antique ruby palazzo pants with black loafer flats and an antique ruby messenger handbag. 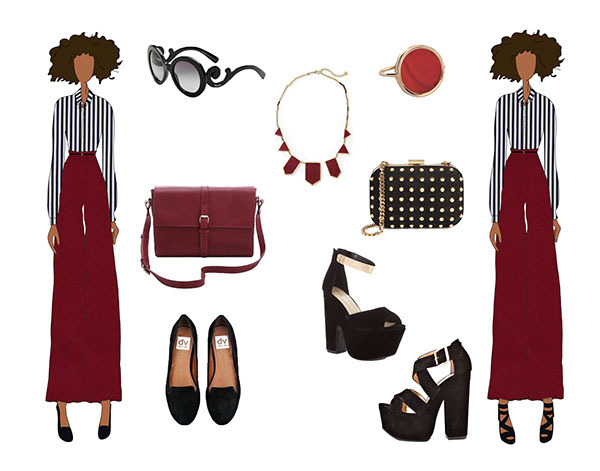 It’s accented with black round sunglasses and an antique ruby geometric necklace and ring set. This trend is perfect for a day at the office or running around town. To take this this trend from day to night requires such small changes that it may surprise you. Try it out with a black open-toe chunky heel, an antique ruby spikey clutch with a shoulder strap, and lose the sunglasses. It will go from casual to cute and spicy before your eyes, making it perfect for a drink at the bar or even date night! The second trend is a coral pink strappy tank top and tan shorts with coral pink and black stripes along with black strappy sandals and an almond tote bag. This trend is a simple, cute style for a day of shopping or spending time with friends. This trend can be transformed from day to night with a few quick changes. Try this outfit with a pair of ankle strap heels or dressy wedges and a black clutch purse. Accent it with some gold bangles and oval hoop earrings and you’re ready to head out to the club! This is a blog post I created for Fashion Friday. Fashion Friday was created by the ladies of the Single Wives Club, where I hold the position of the Social Media Socialite (Intern).